Directed by Nati Baratz. 2008. 102 minutes. In English, Tibetan, Hindi and Nepali with English subtitles. Unmistaken Child begins with an ending. It is October, 2001, and a great master of the Tibetan Gelug tradition, Geshe Lama Konchog, has just died in Kathmandu, Nepal. At his cremation, we meet his longtime student, Tenzin Zopa—an intense young man whom the film will follow as he journeys to India and through northern Nepal over the next several years in a quest to find the reincarnation of his beloved master. In the various traditions of Tibetan Buddhism, there is no fixed method for determining whether and where a master will be reborn. Monks routinely attend to their dreams, to the pronouncements of oracles, and to suggestive signs appearing in the physical environment at the time of, or shortly after, a master's death. The ensuing search may take years, and there is never any guarantee that it will succeed. A successful search—one that concludes with the finding of a new incarnation—irrevocably impacts the life of a young child and the standing of the child's family within the surrounding community. 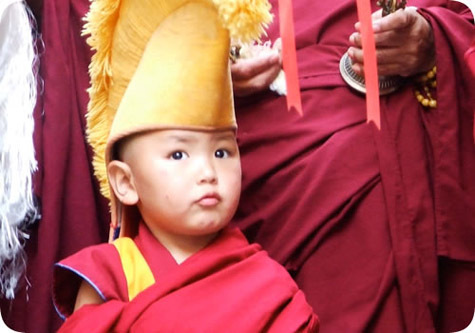 Unmistaken Child affords viewers a rare opportunity to witness a search in progress, and thus to see how classical Buddhist ideas about rebirth impact the lives of monastics and laypeople on the ground. Its subject matter is very well suited to high school or university level students, though some younger viewers may find the film a bit slow. (Personally, I found its deliberate pacing to be very effective in revealing the frustrations and uncertainties that beset Tenzin Zopa's journey. This is not a thriller, nor does it intend to be.) Students who find themselves growing impatient with the pace of the film may take solace in the beauty of its setting: the Gorkha district of Nepal, where much of the action takes place, is breathtakingly beautiful, and cinematographer Yaron Orbach's camera does it justice: the film looks stunning. But Unmistaken Child is stunning in other ways as well. To his considerable credit, director Baratz manages to set and sustain a tone that is all too rarely achieved in films about Tibetan Buddhism. Rather than giving in to the temptation to provide quasi-omniscient voiceover narration (of the sort that all too often substitutes superficiality for genuine insight), he allows his subjects to speak for themselves. This is a risky move, particularly when one is dealing with a religious tradition that is likely to strike many viewers as arcane, but in this case it is a very wise move. Viewers are not told how they should respond to what they are witnessing, and are instead granted room to come to their own conclusions. For this viewer, perhaps the most striking aspect of the film lies in its portrayal of Tenzin Zopa, who emerges as a humane and sympathetic man, at once passionately committed to his quest and bracingly forthright about his sense of being overwhelmed by his responsibilities. Stung by grief and loss, he is nevertheless hopeful and committed to his cause—a cause that viewers are likely to find less and less alien (and alienating) as the film proceeds. The film thus strikes a remarkable balance: without ever descending into didacticism or sanctimony, Baratz patiently and carefully cultivates both empathy with Tenzin Zopa and respect for the integrity of the tradition he is working to uphold. Because it rejects facile explanation, Unmistaken Child is likely to raise as many questions as it answers, particularly among students. This is a good thing. I suspect that most teachers who opt to use the film in the classroom—whether at the high school or university level—will find that it fosters a very lively post-screening discussion. Richard Nance is assistant professor of South Asian Buddhism in the Department of Religious Studies, adjunct assistant professor in the Department of Central Eurasian Studies, and an affiliated faculty member in the India Studies Program at Indiana University, Bloomington, Indiana. His first book, Speaking for Buddhas: Scriptural Commentary in Indian Buddhism, is forthcoming from Columbia University Press. Unmistaken Child is distributed in the U.S. by Oscilloscope Laboratories. Institutional price of $275.00 includes Public Performance Rights for educational purposes.